I regularly search the internet for solutions to problems and one of the things that really irritates me is people who give totally unhelpful and often times rude answers to people’s requests for help. Sure sometimes you come across a thread where someone asks a really “dumb” question but that doesn’t mean you should berate or insult the person by just saying something like RTFM (Read The Fu*king Manual) or some other totally unhelpful remark which doesn’t answer their question. The RTFM responses generally appear most often in the *NIX communities from what I have seen. If you don’t have anything nice to say then don’t say anything at all… an RTFM remark helps no one. 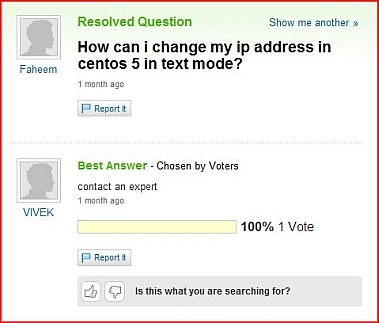 And in case you were wondering… Here is a link to a web page which explains how to change the IP address in Red Hat Enterprise Linux 5 (RHEL 5) which happens to be the same way to change the IP address in CentOS.